HOUSE OF MYSTERY #195 TITLE SPLASH PAGE 1 (1971). Media Type: Pencil and Ink. This nice SPLASH features stunning detail that is reminiscent of Bernie Wrightson's most renowned FRANKENSTEIN artwork, as we see a beautiful image of the DC horror host: Cain telling the horror story! The detail on the faces at the bottom are incredibly detailed also! Splash is signed by Bernie Wrightson in ink at the bottom also! Just a great opportunity here to own this NICE splash! 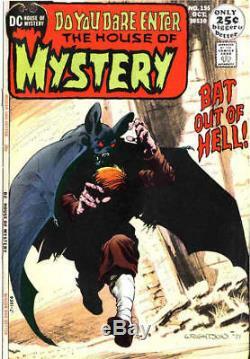 From his groundbreaking work on Swamp Thing, into the "Studio" era with colleagues Barry Windsor Smith, Michael Kaluta, and Jeff Jones, and onto mainstream visibility in the 1980s with projects like Cycle of the Werewolf and Creepshow, Wrightsons accomplishment and influence has been as broad as any artist emerging from the realm of comic art. His work in comics and illustration art is in a class by itself among collectors and fans of the medium. 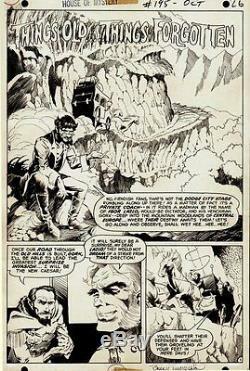 The item "Wrightson, Bernie HOUSE OF MYSTERY 195 TITLE SPLASH PG 1 Original Art (1971)" is in sale since Saturday, July 19, 2014. This item is in the category "Collectibles\Comics\Original Comic Art\Splash Pages".